Located on the north side of Betlémské námestí, the Bethlehem Chapel is a faithful reconstruction of the original 14th century church in which Jan Hus preached between 1402 and 1413. Chapel was built by followers of the radical preacher Jan Milíč between 1391 and 1394. 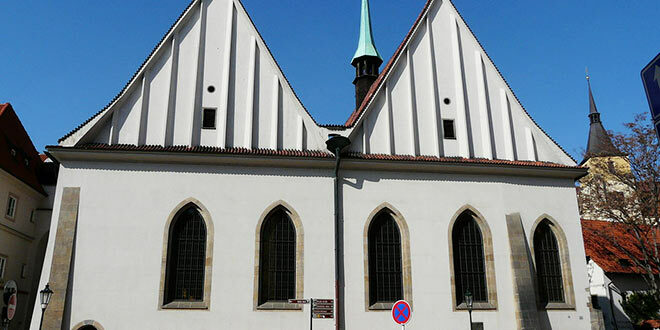 At the time, Prague’s Catholic authorities had agreed to a small chapel on the site where mass could be conducted in Czech. However, upon completion, the Church was alarmed to find that a much larger 3000-capacity building, with a focus on the pulpit rather than the altar had been erected. Jan Hus, the Hussite leader made it his own for the next decade or so, after becoming rector of the Carolinum in 1402. Filling the chapel on a regular basis, he favoured the teachings of English reformist John Wyclif, also translating his “Trialogus” into Czech. By 1410, however, the local synod had demanded that Wyclif’s work be burned, while Hus himself, who continued to openly defend Wyclif, was excommunicated that same year. Later imprisoned and then expelled from Prague, Hus eventually returned in 1415 to appear before the Council of Constance. Providing a full account of his doctrine, the Church failed to show any leniency, whereupon Hus was tried, condemned and burnt at the stake for his beliefs. The chapel continued to serve as a reformist place of worship under the leadership of Hus’s friend Jakoubek of Stríbro, eventually becoming part of a Jesuit Order until 1773, when it was demolished to make way for a private dwelling. The church was completely rebuilt and in 1786 a residential house was built on the side. Following old illustrations the chapel was reconstructed after the WWII. Open: 1 Apr-31 Oct, 9am-6pm daily (9.30am-5.30pm daily from Nov-Mar). Closed: 1 Jan, Easter Mon, 1 and 8 May, 5-6 July, 28 Oct, 24-26 Dec.